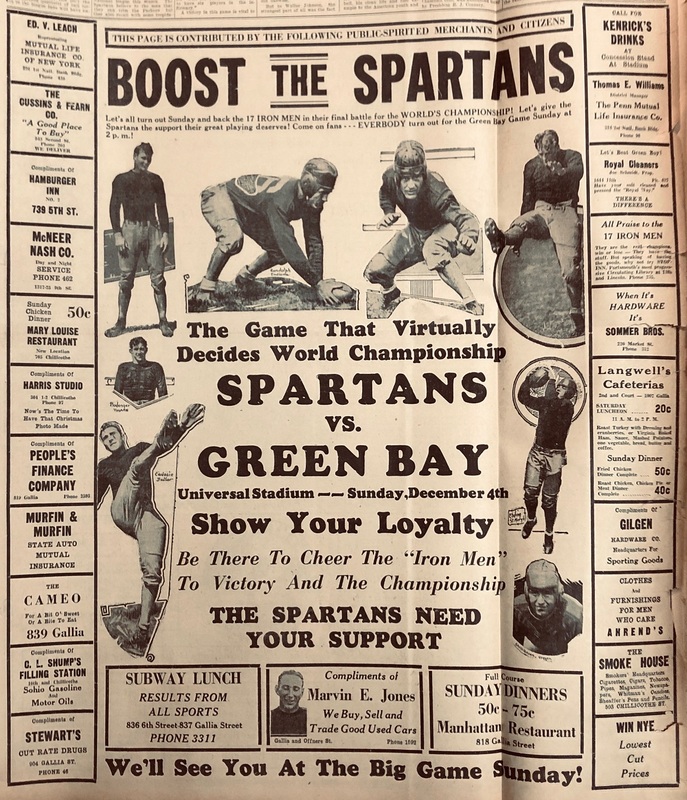 "Boost the Spartans- The Game That Virtually Decides World Championship," read an advertisement from 1932. Manager Harry Snyder and the Spartan shareholders were attempting to boost ticket sales. Attendance numbers in Portsmouth were down- but the marketing campaign for the game on December 5th, 1932 resulted in a record breaking crowd. "Show Your Loyalty. Be There to Cheer the 'Iron Men' to Victory and the Championship." The game, while indeed important, did not decide the NFL championship in 1932. But the Spartans did manage to knock the Packers out of contention and go on to face the Chicago Bears in the first ever championship match.